Thanksgiving is upon us and Christmas is just around the corner and as I was shopping online I came upon this and thought that you all might like to read it as well. However I did not write this myself, I found it on another site here. The article below is an excerpt, please stop by their website for more. I myself enjoy reading about other traditions and cultures around the world and hope you’ll enjoy this one as it even has some elements of our modern day Christmas. Julebukk has a long tradition in Norway and even though its form and meaning has changed over time, the symbol of julebukk remains to this day – bringing the community together at Christmas, Juletid. In old Norse tradition the julebukk (yule goat) was originally the goat that was slaughtered during Romjul, the time between Christmas and New Years. The julebukk became the symbol of the pagan julebukk ritual. It was a spiritual being that dwelled in the house during Christmas, overlooking the preparations and celebrations. It later became personified and during the darkest nights of the year, a man or men (from the community) dressed in a goat mask and fur cape to represent the ghosts of winter night. They travelled from door-to-door receiving gifts from the towns folk to thank them for protection and keeping the winter ghosts at bay. They also gave warnings, especially to children, to be nice. When Christianity appeared the pagan rituals of julebukk were replaced by the children’s activity, also called, julebukk, which is very similar to Halloween. Children walked from house-to-house singing carols at the doorsteps of friends and neighbours. They wore costumes, particularly masks to hide their identity, and often gave gifts as well as receiving them. Afterwards the tradition progressed onto serving the poor children in the community. They dressed in costumes and visited the wealthy, singing carols and receiving food or money, so they could also have a happy Christmas. Some of the elements of today’s Santa Claus come from the traditions of the julebukk such as giving presents, receiving sweet treats, picking out who is naughty and nice and, of course, magic. Today in Norway, the figure of the julebukk is used as a Christmas ornament. 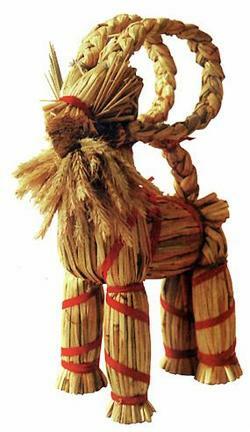 It is often made out of straw with braided horns and a red ribbon around its neck. Julebukk straw figures are usually placed under the Christmas tree. A popular prank is to smuggle the julebukk into the house of a friend or neighbour and place it somewhere to surprise. Once found, the neighbour must do the same to the next family; and so the julebukk travels from house-to-house. In some places in Norway children still dress up and travel door-to-door singing, but often they are the ones who give out gifts and sweets. Their costumes are usually made of old woolen clothes, likely to symbolize the charitable giving to the poor children in the Nordman times.